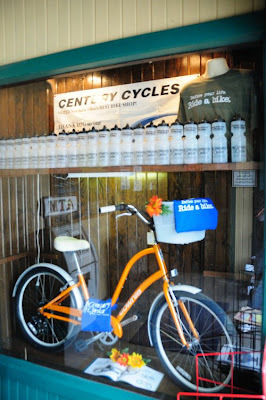 Century Cycles Blog: Check us out at The Winking Lizard Tavern! Thank you to The Winking Lizard Tavern in Peninsula for letting us display some of our "propaganda" in their entryway! Shown is the Electra Women's Townie 7D in Orange Pearl ($439.99). Doug actually owns shares in the place. I wonder what the inside of that place looks like? Is this an invitation?! When is happy hour?